Review posted August 4, 2018. Coronet, 2011. First published in the United Kingdom in 2010. 293 pages. 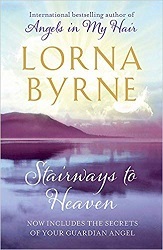 Stairways to Heaven continues the life story of Lorna Byrne begun in Angels in My Hair, including telling about the process of becoming an author and people finally knowing that she can see angels. Lorna Byrne has been able to see angels all her life. This book begins after her husband’s death and tells how the angels helped her move with her youngest daughter to a new home. Along the way, she reveals many things that angels have told her about life and about spiritual things. Some of the things in this book seem a little out there. I’m thinking that it’s possible that even with all the study of the Bible I’ve done, I don’t know everything there is to know about spiritual things! Lorna Byrne doesn’t claim to know it all either, and she has a simple, humble style. She just tells what the angels have told her. Since this book covers publishing her book, she’s also starting to answer many of the questions that people ask her now that the world knows she can see angels. For the most part, these things are extremely inspirational and uplifting. Some points I especially like are that each one of us has a guardian angel who loves us and is with us always. And that there are many other angels all around us that we can call on to help. Many of us don’t understand how important the relationship between mankind and angels is. We have free will, but we have angels to prompt us to do the right things, to prompt us to do what God would want us to do in each and every circumstance. This is the task God has given angels and, because it is God’s task, angels will never ever give up. Every time you pray you are talking directly to God. Regardless of your belief in angels, angels are praying with you at the same time, adding power and strength to your prayer. This is one of the tasks God has given the angels. We never pray alone. This is an inspiring and eye-opening book, though, like me, you may have to set aside some of your previous assumptions to fully appreciate it.